QRPlaza Cards - the best way to give life and emotions yo your gifts. Note: read the code on the picture with your smartphone to view some demo contents. Anyone will shoot your card could be in direct contact with you and add comments to your Card contents. To view more demo cards please click on the link below. 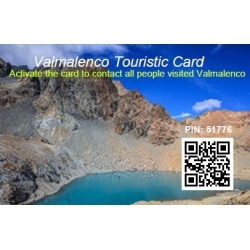 Anyone will shoot your Tourist Cards could be in direct contact with you and add comments to your Card contents. Key Benefits of QRPlaza Tourist Cards: 1. Allow tourists who will activate the Tourist Cards to be in touch with each other in the place room dedicated to your tourist location (direct chat between registered users and sharing messages, photos, videos in the wall) ; 2. Hiring All Card Owners Owners; 3. Have all publications, brochures, maps, brochures, etc. of communal and municipal and private services, sports facilities conveniently in your pocket and Smartphone range, thus saving on printing costs and reducing paper consumption (after reading the demo codes click on the "View brochure" button). each Card may be associated with unlimited digital content; 4. Enjoy special discounts at hotels, restaurants, pubs, facilities, sports centers, gyms, spas, events and trace the presence of users in these locations (even for security issues); 5. Send newsletters about the seasonal community initiatives to all users registered in the dedicated Place Room and holders of a Card; 6. Possibility to collect Cards (with backgrounds and graphics of a different type as examples) and all the digital contents contained therein; 7. Possibility to update content, list of services, offers, partners and events in real time without changing the Card; 8. Opportunity to upload personal content on each Card (photo, video, link, news, etc.) and share the digital card in the main Social (any physical card will also be available in digital format); 9. Every smartphone available to structures, operators, local police becomes a card reader; 10. Direct communication of initiatives, shows, events, seasonal markets directly to the card in pdf or digital format (up-to-date content); 11. Possibility to load on each card, personal files and password protected; 12. Sending emergency messages to all members of the resort in the resort area in case of particular alerts (weather warnings, avalanche bulletins, etc. ); 13. Activate card recovery function in case of loss of Card; 14. Each Card is associated with a single personal and non-transferable profile; To read the printed codes on the cards we recommend the I-nigma App, available on all mobile platforms or any other QR-code reader.